From 2013 to 2017, IOI hosted a group of volunteer dentists from the University of Connecticut. This project is a cooperative effort between IOI and El Ministerio de Salud Publica on Isabela. During the week the dentists are on the island they do cleanings, extractions, fillings, x-rays – whatever needs to be done. It is a busy week. The dentist can see well over 400 patients in their short time on the island. Providing dental services is essential as residents often have to travel off island to receive dental care. The success of the dental clinics paved the way for additional medical clinics to come to the island. Ophthalmology, another medical service that is out of reach for many residents of Isabela, is incredibly important. 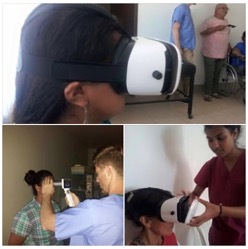 Ophthalmologists, in cooperation with Miami’s Bascom Palmer Eye Institute, come to Isabela for one to two week long clinics to perform eye exams, and provide ocular care to those in need. In the very first ophthalmology clinic, held in June 2016, 269 patients were seen in the first week. In 2017, we set out to ensure that 100% of the population of Isabela had an opportunity to be seen by an ophthalmologist. These clinics are supported by the Ecuadorian Association of Ophthalmology and the impactful contribution they bring to the community are a key piece of our commitment to the social development of Isabela.